For the EP by Nuclear Assault, see Brain Death (EP). "Brain-dead" redirects here. For other uses, see Brain Dead. Brain death is the complete loss of brain function (including involuntary activity necessary to sustain life). It differs from persistent vegetative state, in which the person is alive and some autonomic functions remain. It is also distinct from an ordinary coma, whether induced medically or caused by injury and/or illness, even if it is very deep, as long as some brain and bodily activity and function remains; and it is also not the same as the condition known as locked-in syndrome. A differential diagnosis can medically distinguish these differing conditions. Brain death is used as an indicator of legal death in many jurisdictions, but it is defined inconsistently and often confused by the lay public. Various parts of the brain may keep functioning when others do not anymore, and the term "brain death" has been used to refer to various combinations. For example, although one major medical dictionary considers "brain death" to be synonymous with "cerebral death" (death of the cerebrum), the US National Library of Medicine Medical Subject Headings (MeSH) system defines brain death as including the brainstem. The distinctions are medically significant because, for example, in someone with a dead cerebrum but a living brainstem, the heartbeat and ventilation can continue unaided, whereas in whole-brain death (which includes brainstem death), only life support equipment would keep those functions going. Patients classified as brain-dead can have their organs surgically removed for organ donation. Traditionally, both the legal and medical communities determined death through the permanent end of certain bodily functions in clinical death, especially respiration and heartbeat. With the increasing ability of the medical community to resuscitate people with no respiration, heartbeat, or other external signs of life, the need for another definition of death occurred, raising questions of legal death. This gained greater urgency with the widespread use of life support equipment, as well as rising capabilities and demand for organ transplantation. Since the 1960s, laws on determining death have, therefore, been implemented in all countries with active organ transplantation programs. The first European country to adopt brain death as a legal definition (or indicator) of death was France, in 1968. In the United States, Kansas had enacted a similar law earlier. An ad hoc committee at Harvard Medical School published a pivotal 1968 report to define irreversible coma. The Harvard criteria gradually gained consensus toward what is now known as brain death. In the wake of the 1976 Karen Ann Quinlan case, state legislatures in the United States moved to accept brain death as an acceptable indication of death. In 1981 a Presidential commission issued a landmark report – Defining Death: Medical, Legal, and Ethical Issues in the Determination of Death  – that rejected the "higher brain" approach to death in favor of a "whole brain" definition. This report was the basis for the Uniform Determination of Death Act, which has been enacted in 39 states of the United States. The Uniform Determination of Death Act in the United States attempts to standardize criteria. Today, both the legal and medical communities in the US use "brain death" as a legal definition of death, allowing a person to be declared legally dead even if life support equipment keeps the body's metabolic processes working. In the UK, the Royal College of Physicians reported in 1995, abandoning the 1979 claim that the tests published in 1976 sufficed for the diagnosis of brain death and suggesting a new definition of death based on the irreversible loss of brain stem function alone. This new definition, the irreversible loss of the capacity for consciousness and for spontaneous breathing, and the essentially unchanged 1976 tests held to establish that state, have been adopted as a basis of death certification for organ transplant purposes in subsequent Codes of Practice. The Australia and New Zealand Intensive Care Society (ANZICS) states that the "determination of brain death requires that there is unresponsive coma, the absence of brain-stem reflexes and the absence of respiratory centre function, in the clinical setting in which these findings are irreversible. In particular, there must be definite clinical or neuro-imaging evidence of acute brain pathology (e.g. traumatic brain injury, intracranial haemorrhage, hypoxic encephalopathy) consistent with the irreversible loss of neurological function." Natural movements also known as the Lazarus sign or Lazarus reflex can occur on a brain-dead person whose organs have been kept functioning by life support. The living cells that can cause these movements are not living cells from the brain or brain stem; these cells come from the spinal cord. Sometimes these body movements can cause false hope for family members. A brain-dead individual has no clinical evidence of brain function upon physical examination. This includes no response to pain and no cranial nerve reflexes. Reflexes include pupillary response (fixed pupils), oculocephalic reflex, corneal reflex, no response to the caloric reflex test, and no spontaneous respirations. Brain death can sometimes be difficult to differentiate from other medical states such as barbiturate overdose, alcohol intoxication, sedative overdose, hypothermia, hypoglycemia, coma, and chronic vegetative states. Some comatose patients can recover to pre-coma or near pre-coma level of functioning, and some patients with severe irreversible neurological dysfunction will nonetheless retain some lower brain functions, such as spontaneous respiration, despite the losses of both cortex and brain stem functionality. Such is the case with anencephaly. Brain electrical activity can stop completely, or drop to such a low level as to be undetectable with most equipment. An EEG will therefore be flat, though this is sometimes also observed during deep anesthesia or cardiac arrest. Although in the United States a flat EEG test is not required to certify death, it is considered to have confirmatory value. In the UK it is not considered to be of value because any continuing activity it might reveal in parts of the brain above the brain stem is held to be irrelevant to the diagnosis of death on the Code of Practice criteria. The diagnosis of brain death is often required to be highly rigorous, in order to be certain that the condition is irreversible. Legal criteria vary, but in general require neurological examinations by two independent physicians. The exams must show complete and irreversible absence of brain function (brain stem function in UK), and may include two isoelectric (flat-line) EEGs 24 hours apart (less in other countries where it is accepted that if the cause of the dysfunction is a clear physical trauma there is no need to wait that long to establish irreversibility). The patient should have a normal temperature and be free of drugs that can suppress brain activity if the diagnosis is to be made on EEG criteria. 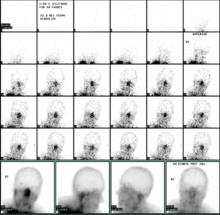 Radionuclide scan: No intracranial blood flow. The "hot-nose" sign is shown. Also, a radionuclide cerebral blood flow scan that shows complete absence of intracranial blood flow must be considered with other exams – temporary swelling of the brain, particularly within the first 72 hours, can lead to a false positive test on a patient that may recover with more time. CT angiography is neither required nor sufficient test to make the diagnosis. Confirmatory testing is only needed under the age of 1. For children and adults, testing is optional. Other situations possibly requiring confirmatory testing include severe facial trauma where determination of brainstem reflexes will be difficult, pre-existing pupillary abnormalities, and patients with severe sleep apnea and/or pulmonary disease. Confirmatory tests include: cerebral angiography, electroencephalography, transcranial Doppler ultrasonography, and cerebral scintigraphy (technetium Tc 99m exametazime). Cerebral angiography is considered the most sensitive confirmatory test in the determination of brain death. While the diagnosis of brain death has become accepted as a basis for the certification of death for legal purposes, it is a very different state from biological death - the state universally recognized and understood as death. The continuing function of vital organs in the bodies of those diagnosed brain dead, if mechanical ventilation and other life-support measures are continued, provides optimal opportunities for their transplantation. When mechanical ventilation is used to support the body of a brain dead organ donor pending a transplant into an organ recipient, the donor's date of death is listed as the date that brain death was diagnosed. In some countries (for instance, Spain, Finland, Poland, Wales, Portugal, and France), everyone is automatically an organ donor after diagnosis of death on legally accepted criteria, although some jurisdictions (such as Singapore, Spain, Wales, France, Czech Republic and Portugal) allow opting out of the system. Elsewhere, consent from family members or next-of-kin may be required for organ donation. In New Zealand, Australia, the United Kingdom (excluding Wales) and most states in the United States, drivers are asked upon application if they wish to be registered as an organ donor. In the United States, if the patient is at or near death, the hospital must notify a transplant organization of the person's details and maintain the patient while the patient is being evaluated for suitability as a donor. The patient is kept on ventilator support until the organs have been surgically removed. If the patient has indicated in an advance health care directive that they do not wish to receive mechanical ventilation or has specified a do not resuscitate order and the patient has also indicated that they wish to donate their organs, some vital organs such as the heart and lungs may not be able to be recovered. ^ "Brain death". Encyclopedia of Death and Dying. Retrieved 25 March 2014. ^ a b c d Young, G Bryan. "Diagnosis of brain death". UpToDate. Retrieved 25 March 2014. ^ Goila, A.; Pawar, M. (2009). "The diagnosis of brain death". Indian Journal of Critical Care Medicine. 13 (1): 7–11. doi:10.4103/0972-5229.53108. PMC 2772257. PMID 19881172. ^ Machado, C. (2010). "Diagnosis of brain death". Neurology International. 2 (1): 2. doi:10.4081/ni.2010.e2. PMC 3093212. PMID 21577338. ^ PVS, The Multi-Society Task Force on (26 May 1994). "Medical Aspects of the Persistent Vegetative State". New England Journal of Medicine. 330 (21): 1499–1508. doi:10.1056/nejm199405263302107. PMID 7818633. ^ Jones, A (2018). "CHEST". Chest. 154 (2): 286–292. doi:10.1016/j.chest.2018.01.021. PMID 29382473. Retrieved 2018-12-27. ^ Elsevier, Dorland's Illustrated Medical Dictionary, Elsevier. ^ (Randell T. (2004). "Medical and legal considerations of brain death". Acta Anaesthesiologica Scandinavica. 48 (2): 139–144. doi:10.1111/j.0001-5172.2004.00304.x. PMID 14995934. ^ "A definition of irreversible coma: report of the Ad Hoc Committee of the Harvard Medical School to Examine the Definition of Brain Death". JAMA. 205 (6): 337–40. 1968. doi:10.1001/jama.1968.03140320031009. PMID 5694976. ^ Life-sustaining technologies and the elderly. DIANE Publishing. 1987. ISBN 9781428922815 – via Google Books. ^ "Defining death: a report on the medical, legal and ethical issues in the determination of death". July 1981. hdl:1805/707. ^ "Legislative Fact Sheet – Determination of Death Act". Uniform Law Commission. Retrieved 8 May 2012. ^ "Uniform Determination of Death Act" (PDF). National Conference of Commissioners on Uniform State Laws. Retrieved 26 March 2014. ^ American Academy of Neurology. (2000, January 13).Spontaneous Movements Often Occur After Brain Death.Science Daily. ^ Karasawa, H; et al. (Jan 2001). "Intracranial electroencephalographic changes in deep anesthesia". Clin Neurophysiol. 112 (1): 25–30. doi:10.1016/s1388-2457(00)00510-1. PMID 11137657. ^ Waters, C. E.; French, G.; Burt, M. (2004). "Difficulty in brainstem death testing in the presence of high spinal cord injury". British Journal of Anaesthesia. 92 (5): 760–4. doi:10.1093/bja/aeh117. PMID 15113764. ^ "Brain Dead - NeuroLogica Blog". theness.com. 2008-04-08. ^ Taylor, T; Dineen, RA; Gardiner, DC; Buss, CH; Howatson, A; Pace, NL (Mar 31, 2014). "Computed tomography (CT) angiography for confirmation of the clinical diagnosis of brain death". The Cochrane Database of Systematic Reviews. 3 (3): CD009694. doi:10.1002/14651858.CD009694.pub2. PMID 24683063. ^ "Understanding Brain Death". What is the legal time of death for a brain dead patient? The legal time of death is the date and time that doctors determine that all brain activity has ceased. This is the time that is noted on the patient’s death certificate. ^ "State and Federal Law on Organ Procurement". Archived from the original on 2014-03-06. Unless the individual expressed contrary intent, a hospital must take measures to ensure the medical suitability of an individual at or near death while a procurement organization examines the patient for suitability as a donor. ^ "Frequently Asked Questions About Donation". DNR will be honored. You can still be a tissue donor.